Abbeys were built a long time ago and as such they can tell us a lot of the past. Nowadays many abbeys have become tourists attractions where you can drink nice local brewed beers (Trappist) and taste abbey cheese (Maredsous). Others have been transformed into cultural centers, serving local communities. In several old abbeys you can even lodge for a couple of nights or a week. But they all have their stories of the past. 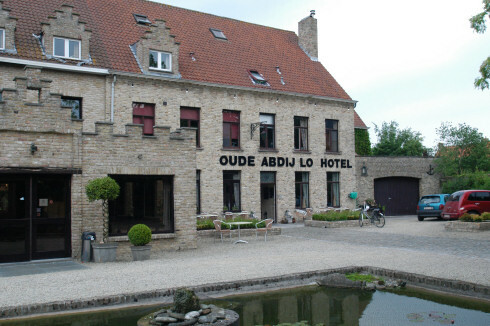 In Flanders an "Abbey" will be indicated as "Abdij". In Wallonia this will be "Abbaye". All points on a single map of Belgium gives a good overview. It unveils that the abbeys are rather equally spread over the whole of the territory. You can always zoom in on a single abbey and on the satellite image you can even see some of the huge buildings, if the imagery is in high resolution. 1 Abbey of Our Lady of Nazareth in Brecht. This abbey is the successor of the in 1236 established and in 1797 destroyed Our Lady of Nazareth abbey in Lier. In January 1950 thirteen nuns from the Soleilmont abbey are the first inhabitants of the new abbey. They are from the monastic order of the Cistercians, also called Trappistines. 2 Norbertine Abbey in Postel. In this abbey live 30 monks and priests. In the abbey shop they sell their own products, like the "Postel Abbey Cheese" and other dairy products, as well as breads. From their herb garden they sell a big assortment of medicinal herbs, all 100% pure. The abbey can be visited by groups on request at Toerisme Mol 014/33.07.85. The abbey has its own restaurant, café with terraces and hall for parties and receptions. Already in 1611 the abbey had a brewery, but nowadays their "Postel beer" is brewed outside the abbey. 3 Trappist Abbey in Westmalle. They invented the word "Trappist Beer" and till today the abbey gets its income from the "Westmalle Trappist Beer". 4 Ter Doest Abbey in Lissewege. From the original abbey remains only the annexes and a huge barn 50 m long, 24 m large and 31 m high. One of the annexes nowadays accommodates a first class restaurant. 5 St. Benedict Abbey in Achel (Achelse Kluis). The abbey has a guest house that is not meant for holidays, but for study days. The abbey itself can not be visited. In the abbey you can find a food store, a tavern and brewery, as well as a book shop. Halls and conference rooms are available for receptions, conferences and events. 6 Priory Klaarland in Bocholt. In the priory live and pray 14 Trappistine sisters. The priory has a guest house with 5 rooms and a separate house with sleep occasion for small groups or families. 7 Saint-Andries Abbey in Zevenkerken. The community of the abbey consists of 40 monks Benedictins. The abbey has a guesthouse with 30 rooms, of which 5 double rooms. In the abbey you will also find a conference hall for 120 persons and in the 3Hoeve" there are 4 halls, one with 70 seats and one with 40 seats. For the guests in the abbey and for visitors there is a cafeteria. Since 1910 there is also a boarding school for 250 boys and girls. 8 Benedictine Abbey Ten Putte in Gistel. This abbey belongs to the sisters Benedictines. The abbey church has been renovated in 1962. In a small building is situated the "mirakelput" (miracle well), where pilgrims take water from Sainte-Godelive. In the abbey there is also a museum, which shows the history of Sainte-Godelieve. The modern reception and reflection center with cafeteria for the pilgrims was built in 1991. 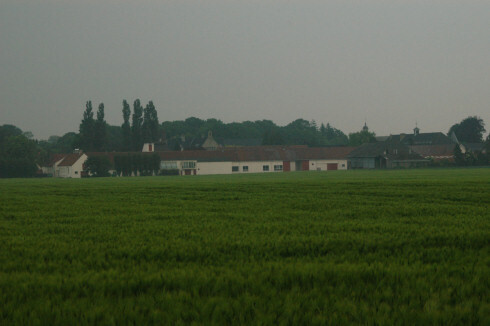 9 Norbertine Abbey in Tongerlo. This abbey also has a guest house for individuals, families and small groups. Larger groups can be housed in a seperate house of the abbey. Not all of the abbey can be visited, but there is enough to be seen to make a visit to the abbey a memorable trip. In front of the abbey is a tavern-restaurant. 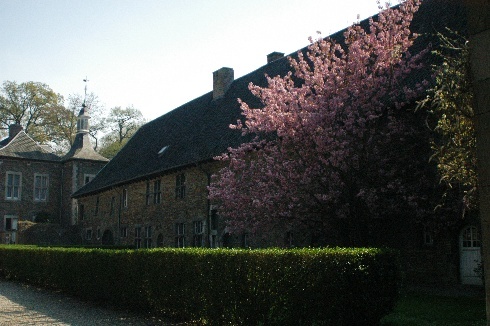 10 St. Bernardus Abbey in Bornem. The abbey is not inhabited by monks or sisters anymore. It is now in hands of the municipality and houses its administration and apartments. In the Northern wing of the former abbey there is a regional geography and history museum. 11 The Old Abbey in Drongen. The abbey and gardens are protected as monument since 1998. The buildings now house a reflection center, a community of old Jesuit monks and some families. 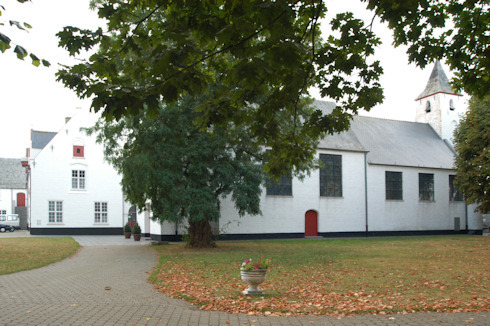 12 Norbertine Abbey in Averbode. The community counts 92 members of whom 39 live in the abbey. The abbey has a quarter for guests, a library and a spiritual center. 13 St. Peter and Paul Abbey in Dendermonde. The abbey can only be visited once a year on Whit Monday. A few number of rooms in the abbey are arranged for male guests only. The monks sell the abbey beer "Dendermonde", brewed by brewery De Block in Merchtem-Peisehem, as well the licker "Smaragdus" and several abbey wines. These products can be bought at the abbey entrance. 14 The Old Abbey in Lo-Reninge. This abbey is now a charming 3 stars hotel with 34 rooms. It is ideally situated when you want to visit the WWI battlefields. The entrance to the Oude Abdij is an impressive lane with old trees on both sides. The fact that it was built as an abbey makes that this hotel with splendid gardens has so much character. 15 Herkenrode Abbey in Kuringen. From the old 12th century abbey nothing remained. The actual buildings like the gatehouse, the water mill, the infirmary, the farm steads, the barn and the residences all date from the 16th - the 18th century. Most of the buildings and surrounding landscape have been restored. Now this 100+ hectares (250 acres) domain is a lovely landscape, ideal for bikers and walkers. 16 Norbertine Abbey in Grimbergen. This abbey in the center of Grimbergen is the eldest inhabited Norbertine abbey of Belgium. Actually the abbey counts about 30 monks in Grimbergen and South Africa. The abbey beer "Grimbergen" is nowadays brewed by Alken-Maes, one of the biggest breweries in Belgium. 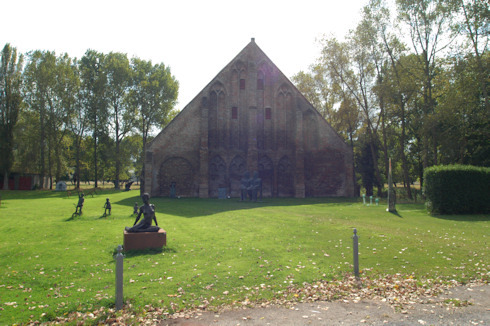 In 1967 the astronomical observatory Mira was erected on abbey grounds and in 1997 the first abbey beer museum was opened in the 17th century farm of the abbey. 17 Benedictine Abbey in Affligem. The first abbey was brutally destroyed by the French in 1796. In 1870 the abbey life revived in Affligem in the stately Bishops House. This was completed between 1920 and 1970 with a wing with monumental cloister and a new abbey church. Now the abbey houses a cultural and a religious center, as well as a house for the youth and a guest house. Visits are possible for groups on request. 18 Vlierbeek Abbey in Kessel-Lo. As so many abbeys this abbey also suffered a lot from the French Revolution. Only the abbey farm, the church and the abbot building remained. The brewery, the bakery and the farm are now private houses. In the West wing there is now a tavern. 19 Keizersberg Abbey in Leuven. This was a rather "young" abbey. Erection started in 1897, but a mass bombardment in May 1944 destroyed the abbey considerably. As the number of monks diminished over the years, part of the abbey has been rebuilt to house student rooms and a community building for students, the "Montecasino". There is also a guest house with 1 and 2 person rooms. Groups of max 20 persons can stay one or more nights too. 21 Park Abbey in Leuven. The number of remaining monks in the abbey has fallen too low to maintain the abbey buildings. Therefore large parts of the abbey are given as a pledge to the city of Leuven, who will restore the buildings. The church and the main abbey building remain in the hands of the Norbertine monks. 22 Trappistine Abbey Marienhof in Borgloon. In the abbey still live 10 sisters all with a respectful age. Also this abbey has guest rooms. In 2005 the abbey won the Monuments Price from the Flemish Community. The whole of abbey and gardens is legally protected as monument. 23 Groeninge Abbey in Kortrijk. This former abbey is now a museum where you can learn all about the history of Kortrijk and the damask and silver from the region. Open from Tuesday - Sunday from 10 AM - Noon and from 2 PM - 5 PM. 24 Val-Dieu Abbey in Aubel. This is the only Belgian abbey that escaped the French Revolution. The last monks left the abbey in spring 2001. From 1997 on beer is again brewed in the abbey and there is also a cheese with the name "Abbaye du Val-Dieu". "Le Moulin du Val-Dieu" (Val-Dieu Mill), part of the abbey complex, is a real tourist attraction. You can taste wonderful regional products, have a nice meal on the porch or try the gastronomic restaurant. Open all year on Fridays, Saturdays and Sundays. From April 1- October 31 also on Wednesdays and Thursdays. 25 Villers Abbey in Villers-la-Ville. The abbey was established in 1147 and closed during the French Revolution (1797). Ever since the elements have transformed it to ruins. Ruins that belong to the most prestigious of Europe. It is one of the most important historic and tourist attractions of Belgium. Open from April 1 - October 31 all days from 10 AM - 6 PM. Rest of the year: From 10 AM - 5 PM, but closed on Tuesday. 26 Paix-Dieu Abbey in Amay. Once an abbey for sister Trappitines, le Centre de la Paix-Dieu is since 1999 run by the Walloon Institute of the Patrimonial Estate. It is the center for professionals in the patrimonial business. Very recently there is a possibility for lodging and restauration in the center. Many rooms of different sizes are available for seminars, conferences and even theatre. 27 Trappistine Abbey Brialmont in Tilff. The sisters of Brialmont have 13 guest rooms for individuals and groups as well as 3 rooms for reunions for max 40 persons. The sisters also grow mushrooms (brown agarics) that are sold in the abbey shop in different forms. In the shop you can find many different products, also from other abbeys. 28 Gembloux Abbey in Gembloux. 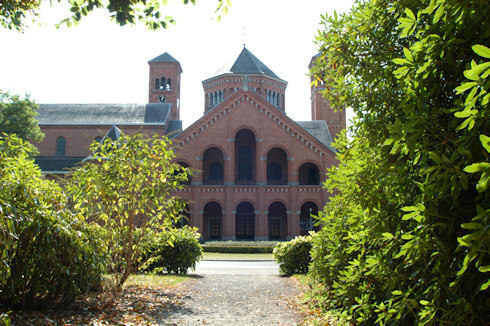 As early as 1860 was established the State Institution for Agriculture in the buildings of the former Bendictine abbey. Nowadays this institution has become the University Faculty for Agronomic Sciences. Guided visits of the old buildings are organized on request by the Tourist Office of Gembloux. 29 Soleilmont Abbey in Fleurus. The old abbey from 1185 is destroyed by fire on Christmas day 1963. Since 1973 a new abbey is erected not far from the old one. 30 Floreffe Abbey in Floreffe. The abbey of Floreffe conceils many artistic, architectural and historic treasures. Guided visits to the church and the museum take place daily every hour on half the hour. Other parts of the abbey can be visited on request. A wide range of local specialties are sold at the Abbey Mill, as there are beers, bread, pies, and cheese as well as hot and whole meals. The old mill-brasserie was restored and transformed into a group of dining/reception rooms. They are open to tourists and visitors who come to taste local specialties. Other rooms can be booked for banquets, colloquia, meetings and seminars. The Mill-Brasserie is one of the most important tourist attractions. From 1983 on the Abbey Beers are brewed by the Brasserie Levèbvre. 31 Stavelot Abbey in Stavelot. Nowadays the Stavelot Abbey houses tree diffent museums: the brandnew Interpretation Center of the ancient Principality of Stavelot-Malmédy, the renovated and enlarged Spa-Francorchamps Racetrack Museum and the Guillaume Apollinaire museum. Opening hours: all year Tuesdays - Sundays from 10 AM - 6 PM. It is also the perfect place for seminars and incentives. 32 Bonne Espérance Abbey in Binche. Today the abbey houses an educational institution with primary and secondary school and a diocesan center for youngsters. It is a place for pilgrims, for visits and cultural organizations. The mill, the brewery, and the bakery are typical for the architecture of the 18 th century. Open on weekends from April 15 - the end of September from 2.30 PM. 33 Aulne Abbey in Thuin. Also this magnificent abbey was destroyed by the French in 1794. The visit to the abbey ruins can be completed with a visit to the brewery "Val de Sambre", situated within the abbey perimeters and where one can assist the brewing process. Cheese is another abbey product. Open from September 1 - October 31 on Wednesdays - Sundays from 11 AM - 6 PM. 34 St. Gérard de Brogne Abbey in Mettet. The abbey is now a farm, a cultural, entertainment, and formation center. The abbey achieved international fame with themed exhibitions that run from January till November. The abbey houses a restaurant, a brewery and a hotel. The abbey is open all year, but the brewery and restaurant are closed on Mondays. 35 Maredsous Abbey in Denée. This abbey is possibly the most beautiful abbey of Belgium. The St. Joseph Center welcomes pilgrims and tourists (cafeteria, souvenir shop, and bookshop). In July and August there are three guided visits a day of the abbey and pottery workshops. There still lives a community of 38 Benedictine monks in the abbey. The abbey has a guest house and organizes youth camps for young people. Maredsous is also famous for its beers and cheeses with the same name. Open all year, every day from 10 AM - 6.30 PM. 36 Our Lady of Leffe Abbey in Dinant. In the abbey one can stay in a retreat house, the hotel and rooms for one night. The beer with the name "Leffe" is now brewed by the biggest Belgian brewery InBev. The former library, separated from the abbey houses a primay school. The abbey can be visited every Wednesday and every Sunday at precisely 3 PM. Guided visits are possible on request. Groups can also stay the night in the abbey. 37 Chevetogne Abbey in Chevetogne. 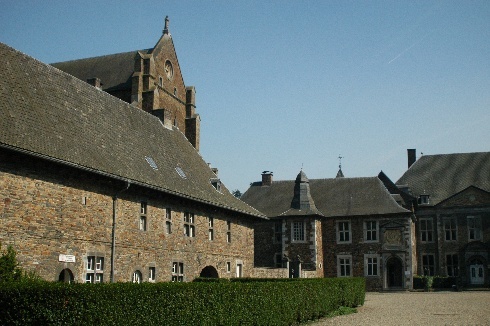 The monastery of Chevetogne was only founded in 1925 and housed in a former castle. The guest rooms inside the enclosure of the abbey are intended for male guests only. Up to twelve persons can be accommodated. Open only after written request. 38 Our Lady of St. Remy Abbey in Rochefort. The abbey has guest rooms for those who are looking for a spiritual ressourcement. The monks of Rochefort brew about 18.000 hecto liters "Trappistes Rochefort" beer in three varieties. The abbey can not be visited. 39 Our Lady of Peace Abbey in Chimay. Today the 30 Trappist monks brew three flavours of Trappist beers and produce four types of cheese, all with the name "Chimay". The abbey itself can not be visited. The "Auberge de Poteaupré" receives the visitors (restaurant-brasserie and hotel. 40 Clairfontaine Abbey in Clairefontaine. The abbey is situated in a real splendid and peaceful environment along the river Semois. The abbey can be visited al year from 8 AM - 8 PM. Closed in January. The abbey church is open to the public. Groups and individuals can stay in the abbey after a written request. The abbey has a shop, a library, and workshops for silk paintings and ceramics, as well as a biscuits bakery. 41 Our Lady of Orval Abbey in Villers-devant-Orval. Another abbey destroyed by the French in 1793. The site remained a ruine till 1926. The actual new abbey was consecrated in 1948. A small museum was installed in the old caves, completing a visitor's tour through the ruins. About 15 Trappistine monks receive the guests for a seclusion for two to seven days in the silence of the Ardenne forests. The abbey receives groups, couples, and individuals, male and female. The meals are enjoyed in silence with a soft background music. It is the "Brasserie d'Orval" who brews the "Trappist Orval", but within the enclosures of the abbey and in the abbey's brewery. And, of course, also this abbey, situated far away in the forests, has its own cheese production: "Fromage de l'Abbaye d'Orval". Return from "Abbeys" to the Home page.